If you look to the right of the page, you'll see that I've started a mailing list. I'll be sending alerts for postings of new wines, other various announcements, and an occasional surprise or two. Simply fill in your email address to subscribe. Rest assured -- no selling of addresses or other such unpleasantries. Spam bad, bad, bad. Seems only fitting for a site focused on inexpensive wine to post a postmortem for Ernest Gallo, Lord of Lambrusco. I'll hold off for now on *cough* tastings *cough* of Gallo. If there's one thing this project taught me -- you don't need to sacrifice taste for cost. That said, Gallo arguably did more to make wine an American household commodity than anyone in recent history. For that, we are grateful. We at the Naked Vine raise our jugs of "Chablis" and "Burgundy" in salute. When I started this little endeavor, I wanted to provide a resource for basic, everyday people to find basic, everyday wine and make the world of wine a little less intimidating. 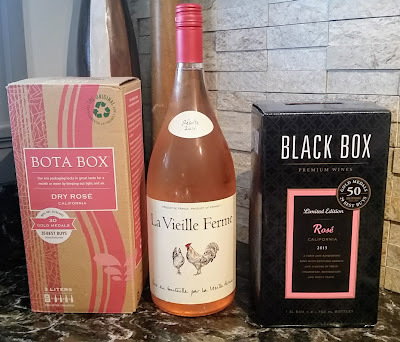 I was having a conversation with the Sweet Partner in Crime the other day, and she made a great suggestion: "Why not do some stuff on wine basics? If you give people a base to work from, they'll appreciate your regular columns even more." There's a reason she's the smart one in the relationship. My plan for the next several installments (although I'll sprinkle in a few other topics here and there) is to provide a basic overview of the major wine varietals, how to recognize them, and what to expect when you do a tasting. I'll do a brief overview of the grapes first, and I'll provide more in-depth coverage of the individual varietals as a follow up. I'll start with the reds. You can, of course, use other wines from these varietals you may have lying around. Fetch three glasses, pour samples side by side by side, line them up, and proceed. Remember, if this process doesn't work as well as you'd like…simply refill the glasses and start again. We begin with Pinot Noir. Pinot noir is the lightest major red varietal. Watch the wine as you pour -- almost translucent. As you swirl the wine (and the reason we do this is here), take a good look at it. It's very light, isn't it? Then take a big sniff. The nose of a pinot is generally soft and fragrant. You'll often smell flowers and cherries. Now a little taste. The taste mirrors the nose -- light and delicate. The finish (flavors left in your mouth after you've swallowed the wine) tends to be soft, especially in comparison to the other wines here. Wine folks (like those in Sideways) greatly appreciate this wine because the flavors are subtle and complex. Regardless of whether or not you're into pulling apart flavors, it's still a very pleasant tasting, drinkable wine. Pinot's flavors also change and intensify as you drink. After the first taste of the Mirassou, wait a minute or so and then take a second sip -- the flavor and finish becomes almost chocolaty at the end. If you're thinking about pairing pinot noir with food (or any wine, for that matter), the operative concept isn't the type of food -- it's the style of food that's more important. Light wines complement light food. A pinot, then, would go with poultry, pork, or fish. It will also work with a number of spicy or saucy foods, as it's an incredibly flexible food wine. On to Cabernet Sauvignon. The first thing you'll notice is the color. The wine is a much deeper, darker purple. It looks much heavier bodied. When you take your first big sniff, you'll notice a smell sort-of-but-not-quite like blackberries. If you hear people talking about "cassis" or "blackcurrant" notes, that's what they're referring to (you can stick to calling it blackberry if you want). The taste is also immediately different. There's fruit and alcohol flavor is much stronger than the pinot when you take the first sip, but the real difference emerges a few seconds after. You'll feel your mouth start to "dry out" with this wine. Cabernet Sauvignon is known to be a very "tannic" wine. Tannin is a chemical naturally occuring in grape skin. Pinot noir is a very thin-skinned grape, thus the tannin concentration will be much lower than the thicker-skinned cabernet grape. The effect of the tannins is a sensation is called "astringency," which you'll also get from strong black tea. The finish of a cabernet is longer -- you'll taste the dryness for quite awhile after you swallow. 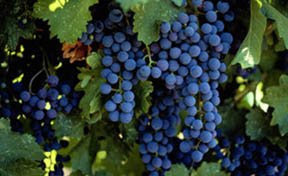 Cabernet is the most tannic of the "major" varietals. That tannin is useful in pairing cabernet with fatty, earthy, or heavy foods. That tannin cuts through the heaviness, allowing the flavor of the wine and the food to complement each other. Grilled steaks, portabella mushrooms, big pastas and chocolates are classic cabernet pairings. Finally, we arrive at Syrah -- the biggest of the reds. Not the driest…the biggest. You can see when you pour that the wine is the darkest and heaviest. The color is blackish purple, generally. (Wine folks call this "inky.") The nose of this wine is strong and fragrant, often full of plums and blackberries. When you taste, you'll immediately sense the "roundness" in comparison to the others. The flavor is usually full of berries, plums, and black cherries. The finish is fruity and not overly dry, and often has a licorice or chocolate flavor (which is why syrah is a fantastic chocolate pairing). You'll taste tannins in this wine, too -- but they're not as pronounced as the cabernet. A good syrah is generally defined as having "firm" tannins. Foodwise, syrah is best paired with just about anything you can put over fire. Grilled meats and vegetables, big stews -- anything with a rich flavor will go well with syrah's richness. Syrah is also a great wine for cool evenings. One other syrah note: you might see wines labeled Shiraz. The Australians called their syrah grapes "shiraz" after harvesting them for bit. Why? Who knows? Just know it's the same grape. Differentiating between varietals is one of the keys to appreciating wine, pairing with food, or just finding something to fit your mood. Eventually, try side-by-side tastings with other varietals to see how they compare. You'll notice zinfandel, Chianti, tempranillo, malbec, merlot, etc. all have unique characteristics. For starters, though, stick with the basics. If you'd like, feel free to pass along what you find from your own tastings. I'd be interested to hear.